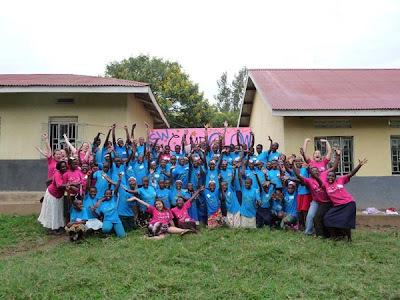 Last week was the most rewarding experience in my Peace Corps service yet – Camp GLOW (Girls Leading Our World) for southwest Uganda! Camp GLOW is designed to help empower girls in their early teens and give them confidence, leadership skills, and help show them the fullness of their potential. 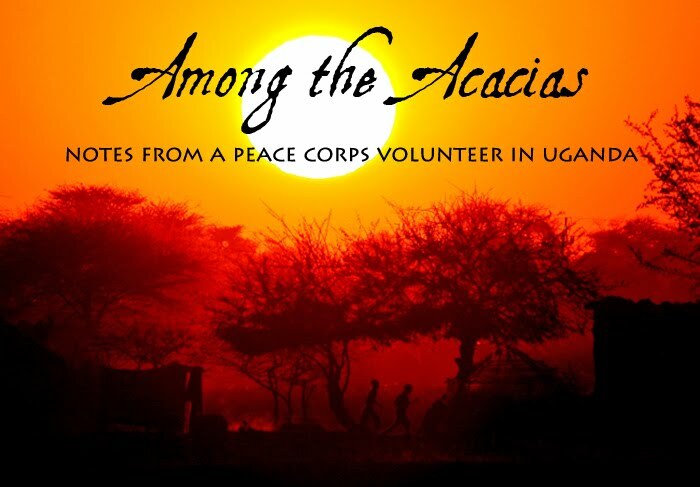 It was started by Peace Corps Volunteers in Romania in 1995 and has been spreading around the world ever since. 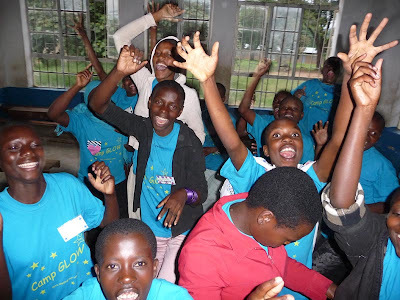 Uganda had its first nationwide Camp GLOW in December 2010, and this camp was meant to target girls from all over the southwestern region. GLOW written by one of the co-directors – “Come on GLOW girl girl show us what you’ve got – show it show it, lady lady, show it show it, shinin’ shinin’!). More chaos happened at 3AM when yours truly went for a “short call” to the latrine – the campers heard the dorm door open and thought it was time to get up (none of them had watches or phones to see the time), so started bathing, getting dressed, etc. We were all sleeping in triple-decker bunk beds so when a few people are up, everyone gets woken up. foot or held the ball, and when they got to the potato/rice sack, simply stopped her in front of it and told her to get into it…). The education system here is all lectures and rote memorization, even from the age of 4 or 5, and there’s really no critical thinking or problem solving to be had, so these skills are so important to foster in these girls. By far their favorite game was Capture the Flag at night – so fun! I felt like I was back at YMCA camp or band camp, haha. The best part was that the quietest girl in my group was the one who captured the flag – talk about a confidence booster! 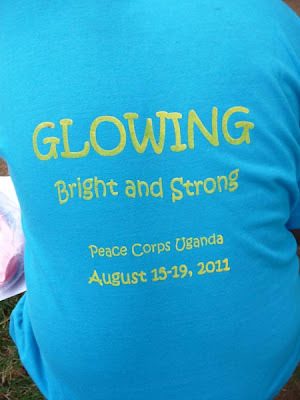 But we all joked that the PCVs had a disadvantage – it took moving to Africa to realize white people glow at night even when there’s no moon. 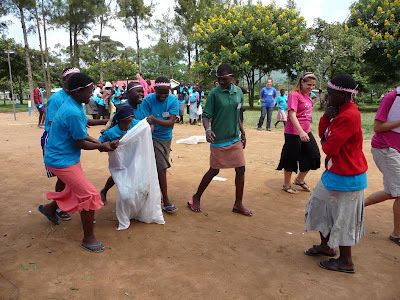 We also had reading time, speeches by strong, successful women, trivia, and even a fashion show where the campers dressed up the 3 male PCVs in women’s clothing and the boys strutted their stuff – soooo funny (and I don’t think Ugandans have ever seen cross dressers before). We even had a Disney movie night and watched Mulan, which has a strong message about gender roles but unfortunately most of the girls didn’t understand what was going on. I think the PCVs may have enjoyed the Disney night more than the campers, and we realized we’ve been in Africa wayyy too long when the main male (cartoon!) character takes his shirt off and we all swooned hahaha. 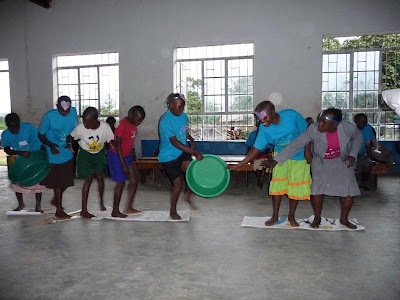 Whenever we weren’t doing a formal activity, we were playing little games, singing songs (each animal group made their own theme song), and trying to stay busy and energetic. A couple of weeks ago, we got a TV and satellite at our Epicenter to act as an IGA (income-generating activity) for our programs. People are supposed to pay 500-700 shillings (20-40 cents) to watch a program, usually football matches, yet, unsurprisingly, there have been several times lately when nobody paid and so The Hunger Project is footing the bill for the generator’s fuel, rather than actually making money as is the whole idea behind an IGA. Regardless, I realized when we turned on the TV for the first time, and people were treated to music videos, news, and National Geographic, that this small window to the rest of the world changes everything. I watched as the villagers gasped at women wearing shorts, nice cars, and rich nuclear Ugandan families in commercials, and this view of life outside the village is one that most of these people have never had before. Viewing these things is exposing them to the modern world, which is a double-edged sword – on one hand they are learning about the bigger picture and gaining new ideas but they are also losing a part of their way of life along the way. Whether you think this exposure is positive or negative, it’s definitely a change that will be there forever. Also, newly-named game popular among PCVs that I had unknowingly been playing for months: “Goat or Baby?” Here in the village, there are lots of goats and lots of children (the average family has 7 children around here!). I frequently hear loud, high-pitched wails coming from nearby, and it always causes one to pause and think, “Goat or baby?” because the two sound remarkably alike sometimes. Just another way to pass the time. We recently had a 1st birthday party for Amanya, my next-door neighbor (Gertrude)’s daughter. I made a yellow cake with chocolate frosting all from scratch, and without a real oven! I’m using a tried-and-true PCV technique of using a dutch oven (big pot with a lid, then inside you put the cake pan on big rocks or sand for conduction and airflow), so I baked a cake over firewood! It was delicious. After having tea, popcorn, peanuts, and cake, we all watched Beauty and the Beast, although I think they found the movie just plain confusing (a big creature they've never seen before? Dancing candlesticks and clocks? What is this?). Baking the cake gave me confidence, so the next day I tried making pita bread using yeast (I have never made bread before in my life) – pretty easy and it came out super delicious! I dipped it in olive oil and basil with some balsamic vinegar that I splurged on in Kampala. If I can do all this in an African village with like 4 ingredients, imagine what I can do with access to an American grocery store! Homemade pita bread… mmm mmm good! Projects! I’ve got a few things going on, including trying to start a support group for HIV-positive community members. I decided to try to start a support group while at the funeral of a friend who died of AIDS. As I was at the burial, I looked around and saw at least 2 or 3 other people I know to be HIV-positive, and I’m sure many others were in attendance, and I just couldn’t imagine the fear, loneliness, and hopelessness they must have been feeling. I also asked people to submit proposals for a Peace Corps grant we can apply for, and the general consensus was to do a goat project, where we distribute goats, and those recipients pass on the first female offspring to another person in the community. I feel unoriginal with this since a neighboring PCV just did a similar project with goats, but I’m happy to have an animal project to work on! I’m still teaching health and life skills at the primary schools, and am planning to do the “World Map Project”, which was started by a PCV in the Dominican Republic in 1988, with one of the schools next term. We will paint a huge map of the world on the side of the school, increasing awareness of geography and the world but also instilling in the students a sense of accomplishment, leadership, critical thinking, etc. since they have never done anything like this before. 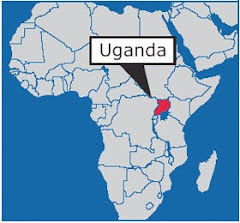 I recently visited a friend’s site where they were completing the World Map Project, and I noticed that the girls doing the project were outgoing, independent, not afraid to ask questions, etc., which is very unusual for young Ugandan girls in the village. When I mentioned this to my friend, he said they used to be shy and never spoke up, but this project had completely changed them. In true Peace Corps style, though, I haven't been super busy at site (although I've been attending all kinds of workshops, etc. away from my village lately), so I've gotten into quite a few TV shows - currently catching up on The Office and Grey's Anatomy, finished the 2nd seasons of Glee and Modern Family (probably my current favorite show), getting into 30 Rock, and have a few more on the docket. Also it's official - I'll be home for Christmas!! Counting down the days - in just over 4 months I'll be State-side! I'm imagining holiday decor everywhere (especially wreaths on streetlamps, since we don't even have streetlamps here), hopefully snow for the true winter wonderland (come on Cincinnati), decorating the tree, eating amaaaazing American food, and seeing how I react to freezing temperatures now that I have turned African and put on a sweater when it's 68 degrees out. Can't wait!